It wore the side wall down on the body pretty bad. $733 for the set of Mickey Thompson Sportsman S/R Performance radial tires I plan to get, with install and balance. My Philly house goes on the market this week. As soon as it sells, I'll hit send on ordering the tires. I'll save the one good tire, buy another eventually, then save a set for the drag strip to run off the street. I don't hate this idea. Dual skinny's would look pretty badass. I'm starting to think I cut the tire driving some twisties through Sumter National Forest, and it took about 3 miles to blow. I suspect drag slicks don't have a crazy amount of sideways strength, LOL, which caused it to roll into the self-tapping screw the PO used to mount a bracket. This dude loved self-tapping screws. This rod, otherwise, handled better than expected. I think with a good street radial, I'll enjoy that type of hooning much better, and not have to worry about the same incident. They make tubes for these. I could probably run a patch inside, and a tube and get away with a few miles on it. $100 for a tube would be the price of such a band-aid. If it looks like the house will sit on the market more than a month, I may go this route, if for no other reason than to get the rear end off jack stands. I hear the Hossiers are better. Depends on what you're looking for. For what I'm looking for, the Hoosier Pro Street and MT Sportsman S/R are virtually the same tire by the numbers. Tread design is the main difference. This whole process has taught me things I didn't know about drag tires. Like, why did it feel like I had flat spots or wheels out of balance? Because they actually had flat spots. Apparently, bias-ply tires flat spot very quickly, so you can't leave them on the car very long while it sits. That's why you see wheels stored by race teams on their side. The sidewall thing I learned the hard way this weekend. I knew better, but didn't really think much of it, until I had to. When it comes down to it, I'm just a Mickey Thompson fan. We ran their dirt tires a lot on our trucks growing up, and I love the M/T SBC parts that have been on the market for years. 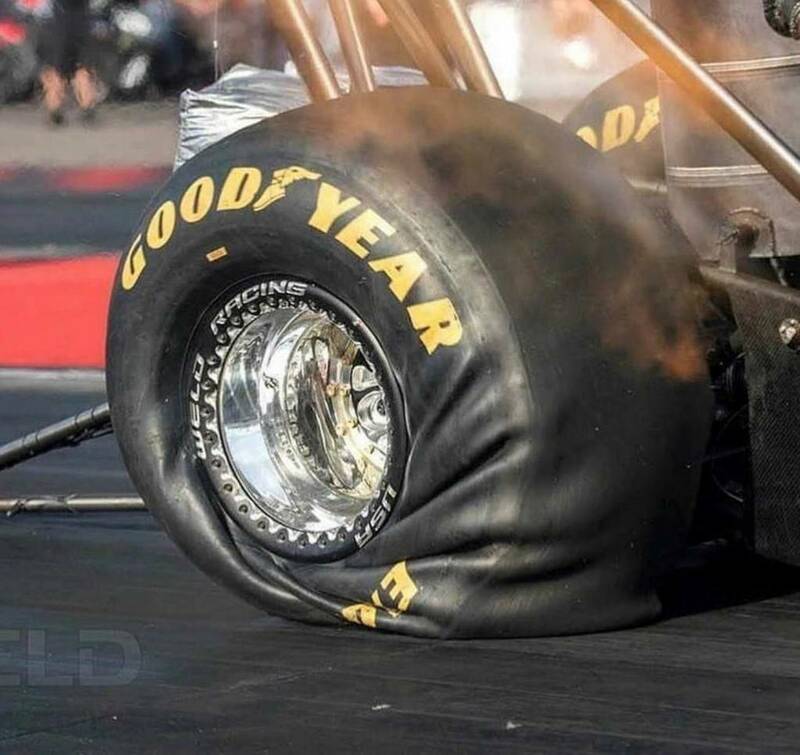 Drag race tires aka wrinkle walls, have no appreciable sidewall strength and can puncture really easily even at street type PSI. Slow motion videos of top fuel wrinkle slicks never cease to satisfy. This allows them to stretch so much that at higher speeds they create a "gear change" because the outside diameter of the tire is increased.